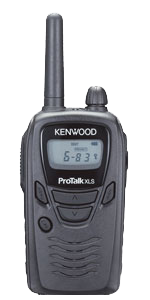 ProTalk XLS TK-3230DX is intuitive to the user. This easy-to-use, UHF portable two-way radio is compact, lightweight, and comfortable to use. The radio blends seamlessly in the business work environment. Compact enough to carry anywhere with ease, the TK-3230DX has a distinctively ergonomic form that's easy to hold and operate. It weighs a mere 5.5oz (155 g) with the rechargeable Li-ion battery and control buttons, which are simple to use with PTT, MON, MENU, CAL, UP and DOWN operations. charger, 2,000 mAh Li-ion battery and a belt clip. Users can modify each of 6 preset channels to any of the 99 pre-stored frequencies. Sub-audible QT tone & DQT digital codes mute undesired voice traffic audio and segregate user groups on shared frequencies or radio system. The user can pick any of the pre-stored channel settings. KENWOOD's FleetSync digital signaling system includes PTT ID digital Alphanumeric Number Identification (ANI) for instant radio call identification. FleetSync also includes caller ID display and selective calling (Individual call, Group call and Broadcast call). Users can also set the alert tone (1-10, Off) for Individual call and Group/Broadcast call. The large 4-digit 7-segment display makes it easy to check on both channel and signaling information. There is also a 3-level icon in the LCD to indicate how much battery power is left. The radio is set to output a tone when the power is turned on. The user can select from 3 selection tones. Channel scanning can be used to monitor multiple channels without searching manually.